You got a taste for how to baby proof electrical outlets in the last post, now let’s talk about all the items that plug into those sockets and how to baby proof electrical cords in your home. To do your audit, keep your eyes primed for electrical cords that run over long distances, hanging cords that loop and cords that are an inconvenience if unplugged (like your alarm clock). Unfortunately, we do not yet live in a completely cordless world but I’d bet some very crafty people riding unicorns in Silicon Valley are working on this as we speak. 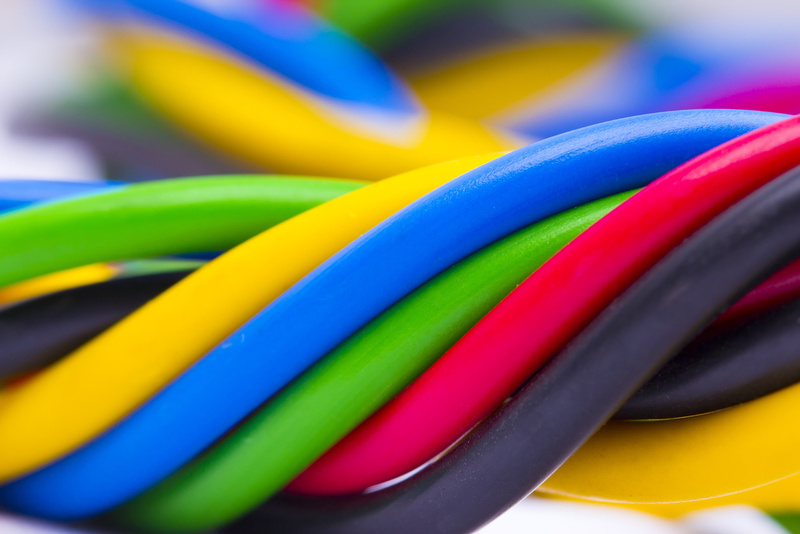 Until that cord-free day comes, the reality is that electrical cords can cause some serious household safety issues including fire, electrocution, or even strangulation. Ugh. Problem: You have extra-long cords. Solution: Roll the extra cord length into a palm-sized coil, use a zip tie to hold it in place. Cut the tie flush so there are no jagged edges. Problem: You have found a cord with frays or cuts. Solution: Throw that sizzler out! It’s just not safe to try and salvage it MacGyver. Problem: You have long cords and you’ve covered them with rugs or put them under the baseboards. Solution: Sorry to be a buzz kill, but concealing your cords this way may lead to overheating and possible fire. It’s best to secure the cord along the perimeter of the room with safety cord covers or cable protectors which usually have anti-trip design built-in. Heads up, some of the colors are pretty miserable but I’ve seen options that are even stainable to match your décor. Tres chic! Solution: For the TV, use an anti-tip stationing straps, they are awesome and worth it in the long haul – hello bonus earthquake safety! Move the lamp as close to the outlet as possible and check to see if the base has a cord winder space to tuck, tuck, tuck. Conceal any extra cord length behind furniture or use cord covers. Problem: You still need your internet to watch cat videos but that requires that awkward router box on the floor. Solution: There aren’t any specific products to cover these devices that I’ve found so see if you can tuck them under furniture and supervise access in that area at all times. Problem: You need an extension cord inside your home to run the family heirloom lava lamp. Solution: You need to get rid of your lava lamp. Seriously. Extension cords are not recommended for long-term in-door use, especially in a house with little ones that just want to yank, pull and chew. Extension cords are also gnarly tripping hazards so it’s time for the grand heave-ho. Baby Proofing Tip: A good rule of thumb from the toy safety world is to keep cords shorter than 12 inches. This goes for non-electrical cords like window cords too as they can become a strangulation hazard. OTHER CONSIDERATIONS: One of the areas of the home that isn’t as obvious for child electrical safety is the kitchen. Got an exposed microwave? Make sure the low-hanging cord is not within reach of sticky little fingers. Keeping appliances away from the edge of any counter top or sink is just good advice especially if you’ve got a little one. Store appliances high up and out of reach when not in use. 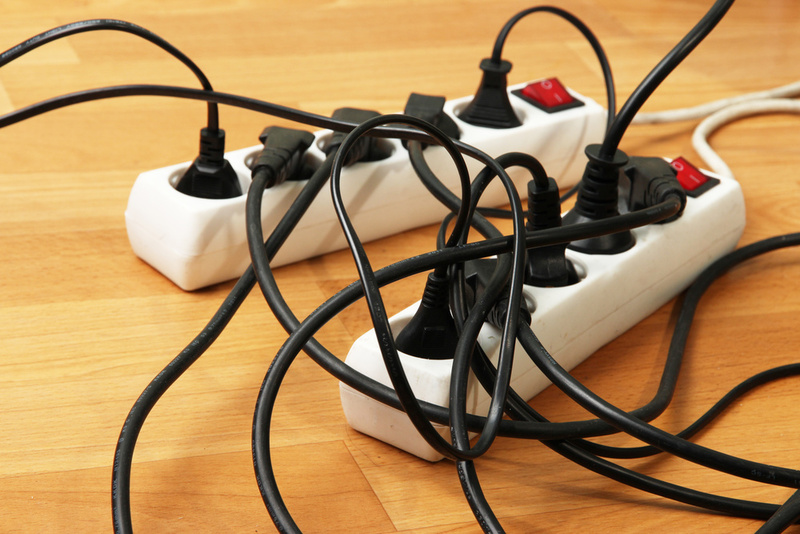 Try not to overload plug sockets, especially with power-hungry appliances like blow dryers and irons. Use a power strip protector to tame the beast of unruly cords. Remember to include the outside of your house when checking for electrical safety. Look for branches that are too close to power lines. Check outdoor electrical outlets and lighting for any issues and make sure that extension cords aren’t creating obvious tripping hazards. Remember, when it comes to child safety, knowledge is power. But power is also power. The key to electrical safety in the home is making sure you are well informed about the hazards of electrical items. By making a few adjustments to the way you manage electricity in your home, and by teaching kids how to interact with cords, outlets, and appliances, you can transform any house into a safer place for children (and pets!). Now that you are the cord master, if you found this article helpful, please like/heart it below and share your questions below.